123951.2 Mary Ann 6 BIGELOW, daughter of James 5 ( Elisha 4, Joseph 3, Jonathan 2, John 1), BIGELOW was born Hartford, Hartford county, CT ______ . She married, on 28 Nov 1802, Arnold Bullard, son of Benjamin and Beulah (Pratt) Bullard. He was born at Hartford 3 Oct 1777. About 1805 they moved to Saratoga, NY and lived near the Mohawk river. In 1830 he was living at Luzerne, Warren county, where he drowned 1 Apr 1834. Mary Ann died 9 Dec 1857, aged 69 years. Both are buried in the hillside cemetery at Luzerne. 12951.21 Mary Ann, b ca 1804 Hartford, CT; d 18 Nov 1882, aged 78 yrs, Luzerne, NY; unm. 12951.22 Charles, b __ Saratoga county, NY; d 2 June 1887 Luzerne, NY; m Polly Swears. 12951.23 Emily, b 1 July 1813; d 4 Aug 1870 Newburgh, NY; m Anson Kellogg. 12951.24 Chauncey, b 18 Sep 1814; d 23 Mar 1878; bur Van Buren, Onondaga co, NY; m Lucy A. __. 12951.25 Lucius, res Luzerne, NY; unmarried. 12951.27 George, b ____ ; m (1) Louisa ____ ; (2) ____ ; res Pendleton, Niagara co, NY. 12951.29 James Palmer, b 8 Sep 1821 Luzerne, NY; d ___ ; m Sophia Orton. Ran across your web site and thought you might find this interesting. The photo was taken in the Whitford Cemetery in Saratoga Springs, NY. 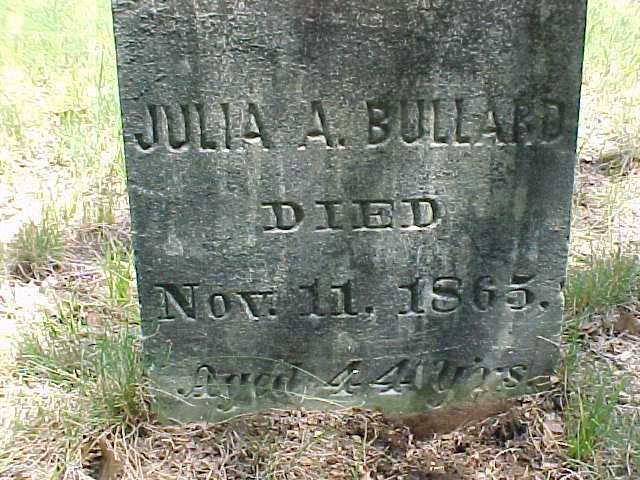 The name and the date matches your Julia A Bullard exactly. So, now, being a Bullard descendant from Saratoga, I question the real burial place of Emily.